Fun in the Sun… Storage Unit! For the past couple of Mondays, teams of volunteers and OO staff have visited London. Not to be dazzled by the sights or entertained in the West End but…. you guessed it… to pack boxes! More boxes! (Thank you Connect Packaging for providing these at cost price for us.) Big boxes, filled to the brim with the most beautifully and lovingly created knitted blankets, hats, scarves, mittens and warm tops! Half a million items came into The Sun HQ and 7 storage units were filled. Just goes to show the love and concern the British public have for the people of Nepal. Feeling able to help on a practical level has given knitters a focus – a special task, channelling their energy into knitting for a great cause. Thank you guys for sending in your lovely things! For buying the wool, taking the time to create and then sending these things in, so grateful for this labour of love. Here are the gorgeous faces of the teams who went to London to pack. They worked very hard indeed. Having to get up at the crack of dawn to arrive at a reasonable time and working solidly through the day…. 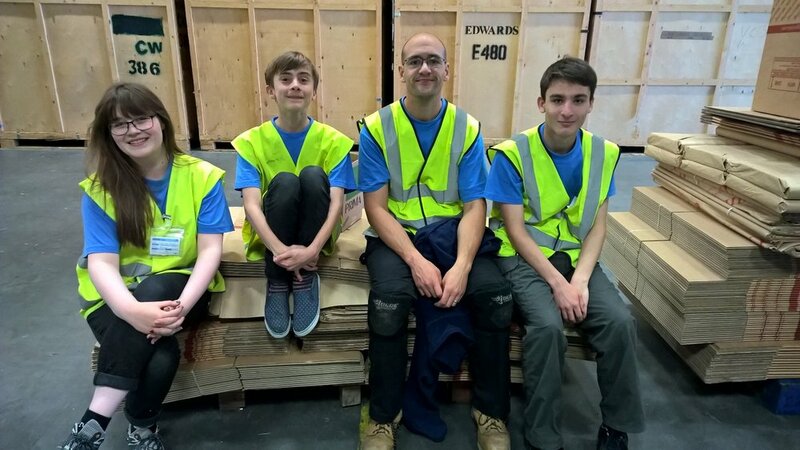 These guys have given their best to help the people of Nepal – THANKS GUYS! I think the reward of a delicious feast at the end of this long day was enough to bring a smile to some faces. Thank you Lucy from The Sun for being inspired to launch this campaign!